Jeanne Le Page, gripped by fear and panic, struggles to breathe as the ferry arrives in Guernsey, the island she had fled 15 years before, traumatised by a family tragedy. Now she has to return after her grandmother's death. Jeanne has inherited her cottage and she plans to sell it before returning to the UK. Unhappy after the recent end of a long-term relationship, she has no desire to pick up her old life on the island. Suffering traumatic amnesia after being involved in the accident that killed her family, Jeanne has experienced nightmares for years. The return to Guernsey triggers frightening flashbacks and she undergoes hypnosis to recover her memory, reliving the tragedy as the ghosts continue to haunt her. But someone on the island does not want her to remember, and she faces danger from an unexpected source . 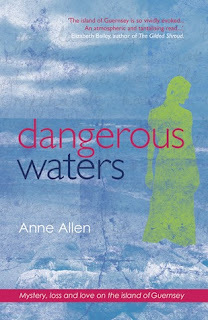 . .
Anne Allen's debut novel, Dangerous Waters, is a combination of understanding loss, facing fears, and finding love. Allen gives the readers an in-depth look at the life of Jeanne, a woman who struggles to accept what's happened to her and a desire to know why. Throughout the novel, readers follow Jeanne's story as she moves back to her birth-place, Guernsey, and begins piecing together her past. She's a well-crafted character full of life and love. She trusts easily and shows those around her how much she cares for them. The connection between reader and character is slow at first, but picks up towards the middle of the book. As Jeanne begins researching her family's history, readers will see the heart of Jeanne and be able to form a friendship with her. The reaction to her discoveries creates the foundation for making her a real-life character. The plot of Dangerous Waters was incredibly in-depth. Readers will have no choice but to be impressed at the thorough research Allen has done to make this novel come to life. The various plot lines swirl together to make one hell of a story, it's incredible to see how Allen perfectly crafted them as she didn't seem to leave anything out. It's a novel that crosses the genres of mystery, cook-book, history, and romance. Dangerous Waters is a stunning first novel that will leave readers anticipating what Allen will produce next.